OpenStack is an open source platform, which offers powerful virtual servers and required services for cloud computing. It is mostly deployed as Infrastructure-as-a-service (IaaS), which aims to provide hardware tools and components for processing, storage, and networking resources throughout a data center. OpenStack can be understood as a software platform that uses pooled virtual resources to build and manage clouds, both public and private ones. By default, OpenStack offers a couple of cloud-related services like networking, storage, image services, identity, etc., and can be clubbed with a few more to get a customized cloud optimization to support the cloud-native apps. In this module, we will learn completely about the basic needs and necessities of OpenStack along with the tutorial to install and get started with OpenStack. How to progress with OpenStack? How to find out which version of OpenStack I am using? How Can I learn OpenStack? First of all, let's address the elephant in the room. Why should we adopt OpenStack? How does it fit our requirements? Here are a few reasons which answer our questions! OpenStack is most importantly an open source environment that gives complete control over the cloud computation. Most of the platforms available in the market, which helps in virtualization and cloud computation, are all expensive and licensed. OpenStack can be installed free of cost and can be customized with the required services to suit the need. Hence many corporations own their own version of OpenStack. Moreover, it can be scaled to any extent possible, making the jobs of the server admins easier. The OpenStack API is made robust and more flexible with improvements contributed by many developers across the world. This also ensures good community support. Many big shot companies in the IT world like Huawei, Intel, Red Hat have adopted OpenStack on their cloud management. Well, most of us are unknowingly the users of OpenStack. Many cloud platforms have integrated OpenStack in their cloud toolkit by default. The OpenStack backend is ever growing with many companies joining in every day! The important terminologies that are repeatedly used in the rest of the module are discussed below in brief. These terminologies are important components of OpenStack architecture. 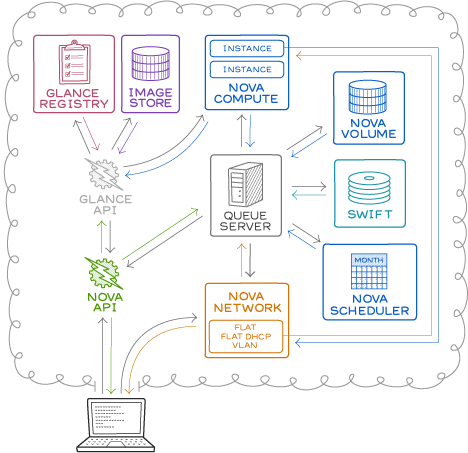 Nova: This is the fundamental computing engine of OpenStack. It manages a large number of Virtual machines and other instances, which handle computing tasks. Swift: Swift is the storage system of OpenStack. It is used to store the objects and files. Instead of referring to the file and objects through the path, developers can instead refer to them through a unique identifier, which points to a file or piece of information and thereby allow the OpenStack to manage where to store the files. This reduces the effort of the developers to understand and worry about storage distribution. This also ensures that the data is being backed up, if in case of any failure of the machine or network loss. Cinder: Cinder is known as the block storage component of OpenStack. This functions in a way, analogous to the traditional ways of locating and accessing specific locations on a disk or a drive. Neutron: As the name suggests, Neutron is the component that enables networking in OpenStack. It ensures that each component within the OpenStack is well connected with other components, to establish good communication amongst them. Horizon: Horizon is the dashboard of the OpenStack system. It provides all the possibilities for the system administrators to access and manage the cloud. This is the first component that everyone “sees” upon starting to use the OpenStack. Developers will be able to access and deal with all the components through the Application Programming Interface (API) also, while Horizon is the only place through which the system admins will be interacting with the OpenStack architecture. 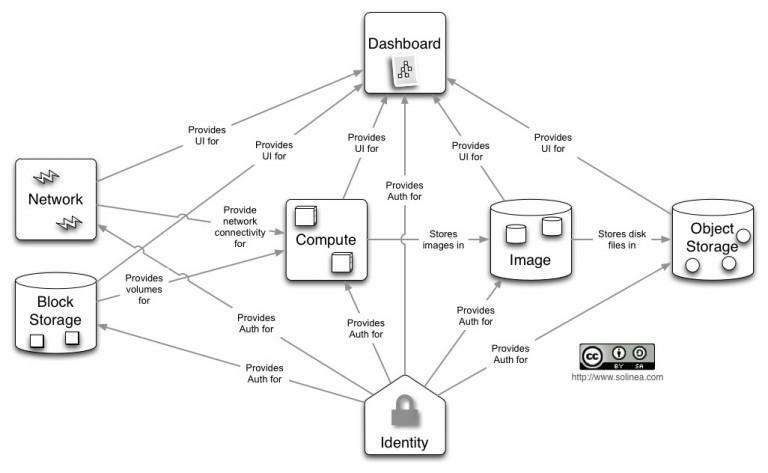 Keystone: Keystone is the component that provides the identity services for all the users. It basically contains a central list of all the users of the OpenStack cloud, mapped to the accessible services of the OpenStack. It provides a way for multiple accesses by allowing the developers to map their existing user access methods to the Keystone. Glance: Glance provides the image services in OpenStack, where images refer to the virtual copies of the hard disks. Glance helps in allocating these images to be used as templates while assigning new virtual machine instances. Ceilometer: Ceilometer provides telemetry services to its users. It performs a close regulation of each user's cloud components' usage and provides a bill for the services used. Think of Ceilometer as a component to meter the usage and report the same to individual users. Heat: Heat is that component of the OpenStack which allows developers to store the requirements of a cloud application in a file so that all the resources necessary for a program are available at hand. It thus provides an infrastructure to manage a cloud application. It is an orchestration instrument of OpenStack. Since OpenStack is the free source available on the internet, open to all developers, finding an authentic link to look for updates becomes tedious. Considering this, Opensource.com is working incessantly to provide the latest updates on OpenStack, which gives the required guidelines to the developments in OpenStack. Besides this, there are many other sources available, which keep the recent updates on OpenStack posted. Mindmajix is one among the best sources for it. We will know more about this later in this module. Compute is one of the most important and mandatory components of OpenStack. It is basically a virtualization hypervisor. In a cloud computing environment, it acts as a controller, which manages all the resources in a virtual environment. It is also used to manage the high-performance bare metal configurations. It is coded in Python and has utilized many pre-defined libraries to deliver robust functioning. The hypervisor technologies that might be used are Xen, KVM, and VMware and this selection, depends on the version of OpenStack used. SQL is used for database access. The above picture dissects the compute and the explanation of the picture is given below. The nova-api handles the requests and responses from and to the end user. The nova-compute creates and destroys the instances as and when a request is made. The glace registry stores the details of the image along with its metadata. The Image store, stores the images predefined by the admin/user. The nova-network ensures the network connectivity and routing. This is responsible for establishing a neuron structure between the components for better connectivity. It manages all the networking related functionalities of the architecture as a whole. Starting from assigning and managing the IP addresses of the nodes to managing and implementing routing, it constitutes all. The instances of the virtual machines or the disk image are stored as images in the image storage Glance. This is the mountable storage unit of the architecture. It helps in data replication across the data center. The files and objects can be copied to multiple units with the help of this unit. The object storage units are replicated with every new server addition. It also stores the replicate content from all the active nodes and makes it available to the new clusters, ensuring a backup in case of any hardware failure or server loss. Block Storage provides persistent level storage facilities for cloud-oriented computing devices. It helps in the creation, addition, and removal of the new block devices in the server. It provides complete integration with the OpenStack, reducing the use of extraneous hardware components. It can be accessed and instructed using CLI or web-based services. Linux based systems can go with Cloudbyte, EMC, Coraid, SAN Storage, etc. Understanding the logical architecture, besides the basic structural architecture, is essential to design, deploy and configure OpenStack. OpenStack is made of all distinct Services. Each of these services is internally configured to have one API service. Each API service is always looking for API requests and these requests when obtained are preprocessed and passed on to the other parts of the service. The diagram below has shown a pictorial representation of the Logical Architecture in OpenStack. All services are authenticated through the one Identity Service (Keystone). Individual services generally interact with each other through the public APIs, except for few, which require admin privileges. For the inter-process communication within a service, AMQP message broker is used. The state of service will be stored and updated in the database. When you are configuring your OpenStack cloud, you can choose the message broker and the database solution from a list of products/solutions available from the market, such as RabbitMQ, MySQL, MariaDB, and SQLite. OpenStack can be accessed on web User Interface through CLI or through API calls using tools like curl or other plug-ins. Ultimately, all these REST API calls will issue access to the OpenStack services. The idea of OpenStack can be better appreciated when we treat it as an environment than as a mere product. OpenStack is a generic infrastructure that is built to handle many possibilities on cloud, based on the need. The companies are free to plug into and make necessary changes to shape the environment to their need. It is also very efficient to handle both public and private clouds with a common infrastructure, cutting down the dependency on two different environments to handle private and public clouds. The average cost and complexity of supporting a generic infrastructure are low by definition, than supporting a large diversity of infrastructures which don't share a common ground. As many big shot companies and independent developers are constantly contributing to make OpenStack a better environment, it is more reliable to switch to, than those of independent vendors. When talking about a company, managing both private and public clouds separately costs heavily in terms of the labor, infrastructure investment, customizing capacity of the specific infrastructure along with the added risk. OpenStack, on the other hand, has grown to support private and public clouds more efficiently than any other competitor in the market. Moreover, it is always easier to manage one single environment than two different ones. Owing to all these advantages of OpenStack, which count in the longer run, many companies have adopted it and have integrated into their back-end infrastructure. Some of the companies to mention are, AT&T, Ericsson, Huawei, and Intel. OpenStack, as an open source cloud computing platform, supports all cloud environments. It is contributed by many developers across the world, leading to simple implementation with a rich set of features. There are many versions of OpenStack available. Each of them differs in their installation and configuration by few steps. This section deals with an informative tutorial to follow the deployment instructions of OpenStack. The instruction set is based on example architecture with minimalistic services. The following description is the basic setup requirement for all the versions of OpenStack installations. Example Architecture requires 2 nodes (min) to launch a basic virtual machine or an instance. The example architecture considered here has a minimum configuration to give an idea of proof of concept of OpenStack, rather than going for a production environment. Below are the components required for the example architecture considered. Controller node requires a minimum of two network interfaces. 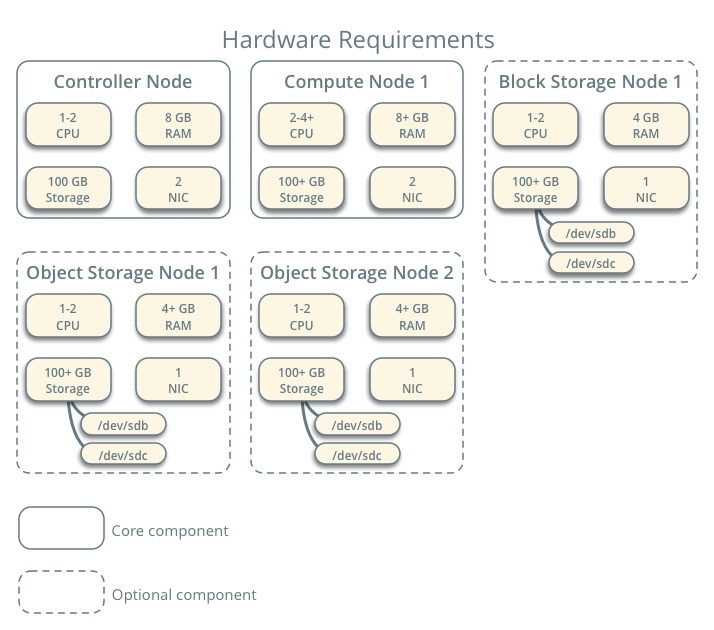 Below picture depicts the hardware requirements for the example architecture. Compute node basically runs the hypervisor portion. By default, it uses the KVM hypervisor. It also runs the Networking service agent that connects the instances to the virtual networks and also provides security through firewalling via security groups. More than one compute nodes can be deployed. 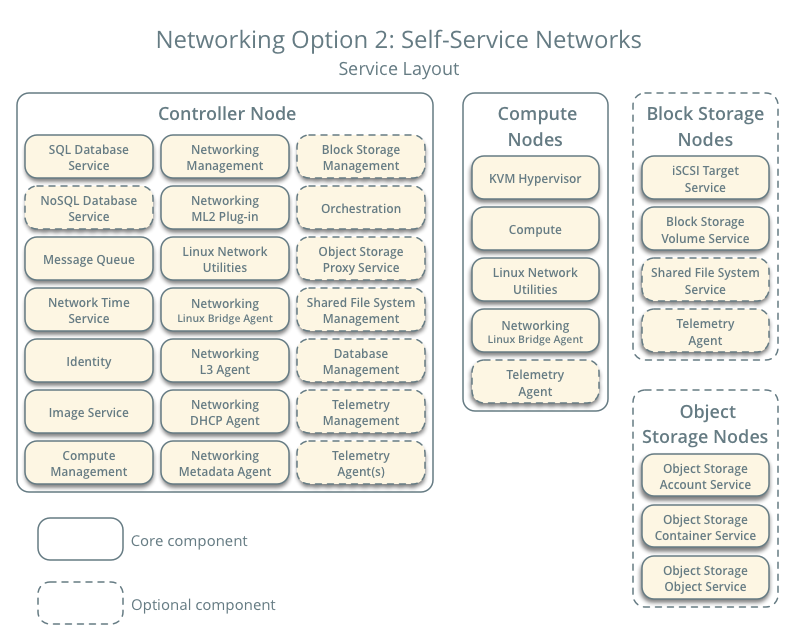 A minimum of 2 network interfaces is required for each Compute Node. 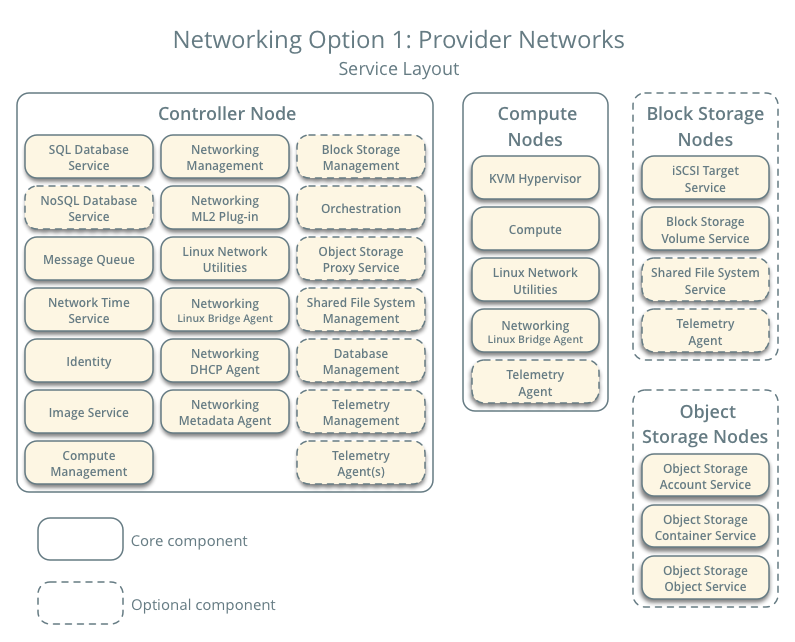 The optional block storage requires a minimum of one network interface. It contains the disks for the Block Storage and the Shared file system services. Production environment should have a separate storage network to increase efficiency. However, for the sake of simplicity, a management network is used between the Compute Nodes and the Block Storage. Like the block storage, object storage is also optional and contains disks that are used for storing accounts, containers, and objects. This service demands 2 nodes. Each node demands 2 network interfaces. More than one object storage service can be deployed in a system. It deploys the simplest of the OpenStack Networking possible with layer 2 (switching/bridging) services and VLAN segmentation networks. It bridges the virtual network with the physical network infrastructure to enable the layer-3 routing services. It depends on the physical network infrastructure for the layer-3 routing services. The Instances are supplied with the IP address information through a DHCP service. This networking method lacks support for the private networks, layer-3 (routing) services, and advanced services such as LBaaS and FWaaS. Consider going for the next option, if you are considering the options said. This method of networking just augments the Provider Networking with the layer-3 routing services, which enable the self-service networks (private networks). They basically use overlay segmentation methods such as VXLAN to include the services for private networks. It routes the virtual network to the physical network using NAT. It also draws a foundation for advanced services like LBaaS and FWaaS. This segment deals with configuring the controller node and a compute node within the example architecture. Many environments include the Image service, Identity, Compute, at least one networking service, and the Dashboard, the Object Storage service is capable of working independently. However, if you want to just try out the Object Storage Service, ensure that the appropriate nodes are configured. In order to configure nodes, use the account in admin privileges. To do this, either run commands as the "root" user or configure "sudo" utilities. Before heading further, make sure that the hardware requirements are met. The following are the requirements to make a proof of concept model for the OpenStack deployment with core services and CirrOS instances. With the increase in the services added to the basic architecture, the hardware requirements also scale up to get the best performance. To improvise the efficiency and reduce cluttering, minimal installation in recommended on your Linux distribution. On each of the node, ensure to install a 64-bit version of your distribution. For most of the application, a single partition on the disk is sufficient; however, for the extra additions like optional block storage, additional partition might be demanded. Try considering “Logical Volume Manager (LVM)" for such cases. Only one physical server is sufficient to handle multiple nodes with any number of network interfaces. Periodic "snapshot" (history) will be marked during the installation process. Hence, you can always "roll back" to a working event, in case of any hiccups. However, the performance of hosts will suffer through VMs, particularly if, the hypervisor/processor is incapable of handling the nested VMs. Note: If you are going for VMs, make sure that hypervisor provides a way to disable the MAC address filtering on the interface of the provider network. Additionally, the other services include the database server and message broker password security. The link given below takes you through the detailed steps of installation, which involves setting up important parameters for the environment and configuring the required services. The last part deals with the launching of an instance. Cloud mainly provides computing for the end users in a remote environment, where they deploy the software programs and run them, instead of a physical environment that has more limitation in terms of capabilities and storage. OpenStack is considered as an Infrastructure as a Service (IaaS), where it helps the users to easily add a new instance on which the cloud components can run. Basically, the infrastructure aims to provide a "platform" on which the developer can create and deploy software applications. After understanding the layers of architecture, it is important to reconnect the dots and understand how OpenStack works! Horizon is the face of the application environment. Everything a user needs to do should start with the Dashboard, which is called Horizon. It is a simple graphical user interface which has the divided modules that perform a specific action. As we know, every action on OpenStack works as a service API call. Every API call is first authenticated by Keystone for the permission availability. So, before you access the dashboard of OpenStack, you will have to authenticate yourself as a registered user, through your login credentials. Once you successfully log in, you will see your dashboard with options to create new image instances, cinder, volumes and to configure network details. The image instances are basically the instances of your virtual machines or environments on which you will configure the cloud. They can be Ubuntu, CirrOS, RedHat, OpenSUSE, etc. You can choose an instance and enter the details like the network configuration, etc. to create a new one. This instance can be connected to new cinder instance or volumes to include any extra services. Remember the creation of new image instance is also an API call. Once an image is created, you can configure it and manage it through the CLI and add whatever data you want to add. You may even want to perform many extended operations on the instance created. Any data computation performed on the cloud instance created will be stored along with its metadata in image architecture and other storage components and thus in the associated databases. You can even configure an instance to store the snapshots, where the state of the disk at any moment will be stored for future reference. This provision is available in the dashboard. Similarly, you can query to get the versions of other components of your OpenStack too. Openstack is known as a platform to provide the cloud computing services. Amazon Web Services (AWS) is also known as a reliable and scalable platform for inexpensive cloud computing services. Both of these platforms are widely used by many shark-companies for the backend configuration. Considering the large-scale implementation, it is important for us to know, which of the two solutions fit our need the best, before deciding to adopt one. The distinct differences of the two are given below. Go through each, to bank on one for the deployment. Whatever OS cloud admins host on the OpenStack. Admins upload the images and generate a catalog for the users. However, users can upload their own images too. AMI(Amazon Machine Image) manages the images. An online marketplace with predefined images is offered. However, the users can upload their own images too. Automatically an IP address will be assigned to every virtual instance. It is managed by DHCP. A floating IP is a public IP and you can dynamically add it to a running virtual instance. The OpenStack LBaaS manages the load balance traffic. AWS allocates every new instance, a private IP address using DHCP. The Public IP is auto mapped to private IP address by AWS. The Elastic Load Balance automatically distributes the incoming traffic from the services to the EC2 instances. To learn the OpenStack environment completely, right from the basics to the installation and advancement, there are seldom any online tutorials or course materials available. Many of the sites either give information on selective topics or are very vague & hard to follow. As an answer to the need of the hour, Mindmajix OpenStack training has covered an in-detail course material on OpenStack. The course content is covered from basics, explained with visual aids and simple language, for better understanding and implementation. If you are interested to know further about the course, please visit the link below. The opportunities for OpenStack developers and technical consultants are on a boom. The available roles in the market on OpenStack extend from an OpenStack engineer, developer, technical consultant, VMware Engineer with expertise in OpenStack, OpenStack neutron architect, etc. to Python developer with automation. Any expertise in OpenStack is welcomed by the IT industry, at present. The average salary for an OpenStack developer ranges from $63000-$125000 in the US. The IT sector is seeing a spectrum shift to complete cloud infrastructure for a decade now. The endless possibilities of cloud computing which encompass the unlimited storage capacity to less cost of infrastructure make it the first choice when it comes to handling the big data. A generic environment which can be customized easily to meet the specific demands makes the OpenStack the favorite choice for many companies across the industry. The open-source nature and incredible community support extend its applications. The future calls for such a robust environment and the OpenStack is going to continue its legacy for being the free infrastructure with some great features suited for the long run. OpenStack is the one of the best cloud computing environments in the market. The databases of many top-notch companies have integrated the OpenStack in their back-end. The ease of linear scalability and open-source nature has attracted many customers and technology enthusiasts to come forward and contribute to the development. This has made the OpenStack, only better with the years. Seeing all the advantages and endless scalable features, OpenStack can be considered for cloud computation as it proves to be an affordable solution for the longer run.